Heat the oil in a saucepan over medium heat. Cook the mushrooms and onion for 5 minutes or until they start to brown. Add the garlic and cook for 1-2 minutes. Put one cup of cold vegetable stock or water, flour, tamari, nutritional yeast, thyme and sage in a jar, tightly cover with a lid and shake until blended. 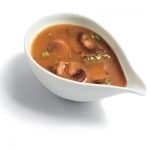 Put the stock and flour mixture plus the remaining stock into the sauce pan, bring to a boil, decrease heat to low and simmer, covered, for 15 to 20 minutes, stirring frequently. Stir in pepper and salt (if using); top with parsley and serve. See Vesanto December 2, 7:30PM at Eternal Abundance, 1025 Commercial Drive. She gives a fun talk on “Veg Simplicity, Veg Diplomacy.” Snacks included.